Mr. Burlak has been providing quality in-home music instruction in Moorestown, NJ since 2004. He is certified in music K-12 in both NJ and PA. He has taught at the Napoli School of Music in Ardmore, and also in Pennsauken Public Schools. He began playing piano at age 5, violin at age 10, viola and cello at 15, and studied wind and brass instruments while a student at Temple University’s Ester Boyer College of Music. He has played for the Symphony in C, the Delaware Valley Philharmonic, and the Princeton Music Connection. 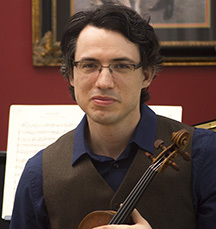 Mr. Burlak offers Piano Lessons in Moorestown, as well as lessons for the string family instruments: violin, viola, cello, and guitar. “I used to think music was an optional activity for kids, something you do for fun. However, the more I teach, the more I see the physical and mental growth music creates in kids - growth which they otherwise would not have. Not playing an instrument (or even two) as a kid certainly creates a disadvantage in the real world, mentally and socially. My students are consistently the overachievers. Is this because they play music or because their parents understand the need to diversify their skills and experiences? I believe it's both. Regardless, working with kids and building relationships that last for years is what motivates me to get up in the morning. "